You are currently browsing the tag archive for the ‘hand’ tag. I have tried many beauty products before, & I’ve got to admit that I really like all of the products I’ve gotten in Japan. There is one particular product that I’ve purchased recently that I have absolutely fell in love with. 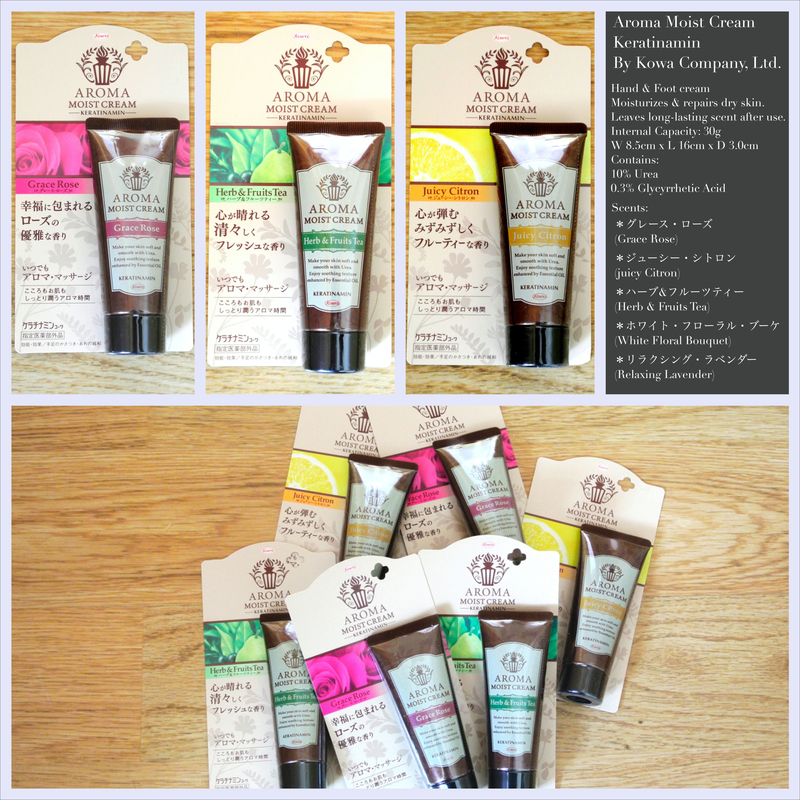 The product is called Aroma Moist Cream, manufactured by Kowa Company, Ltd. It is a rich hand & foot moisturizing cream that comes in five different scents (Grace Rose, Relaxing Lavender, White Floral Bouquet, Juicy Citron, & Herb & Fruits Tea). I came across this cream one day while I was riding the JR metro train with my husband. I happened to spot this advertisement posted next to the train doors & took a picture of the ad with my cellphone camera thinking that I could show the photo to my Japanese friend. Perhaps she could help me find out where I could buy this cream. Then, one evening, one of my female friends had asked to stop by one of the drug stores near our hotel, & that’s when I stumbled upon this cream. It must have been fate, or a coincidence, or something like that. I was so excited that I found this cream, I was tempted to get one tube in every scent. However, my husband being the skeptic (& logical/sensible one), told me to just get one or two tubes since I didn’t know if I would like it or not. 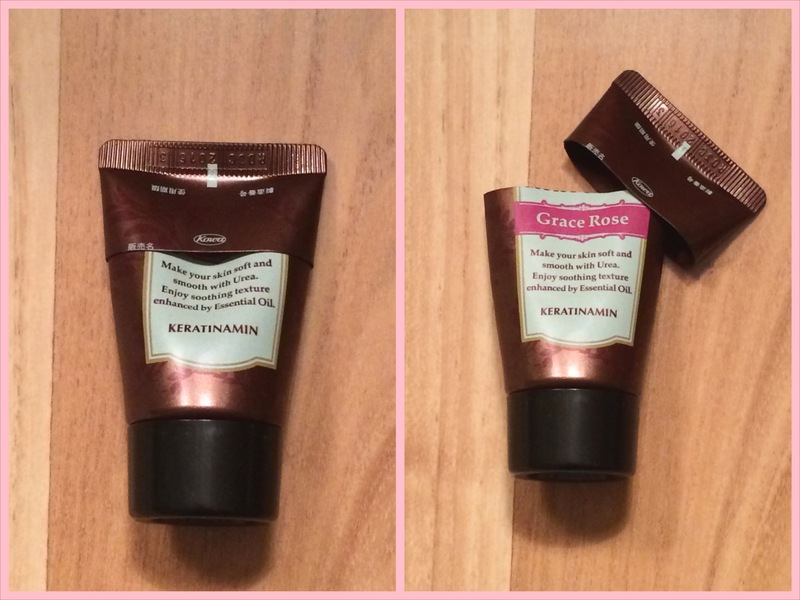 I ended up getting two tubes (Grace Rose & Herb & Fruits Tea). I just fell in love with this cream almost immediately. The cream itself starts off really smooth & soft, but as you work the product into your skin, it becomes thick & rich in texture. It really moisturizes the hands well, & it leaves a gentle scent (not an overpowering perfume smell). No matter what the season, my hands are always feeling dry & my cuticles are always cracked &/or peeling. After using this Aroma Moist Cream for about a month, my hands are feeling less dry & my cuticles are slowly coming back to life. I don’t usually like floral scented anything, but I’ve been using the Grace Rose scented cream, & I am enjoying the soft fragrance. It has a very delicate flower smell without smelling like a chemical perfume (eg. Febreez or those Glade plug-ins). The Herb & Fruits Tea scent has notes of eucalyptus, cassis, rosemary, roses & pear. I haven’t yet tried the Juicy Citron scent…so I’m excited to try it soon. By the time I had returned from my trip to Tokyo this past November, I was mentally kicking myself for not getting more. For weeks I had scoured the internet to see if I could buy this cream online (like at: Rakuten or Amazon) or find out any information about this product. I had practically hit a dead end, until miraculously I was able to find this cream on the Amazon Japan website. The price was also the same as what I paid in Japan which was ¥590 JPY (roughly $5.83 USD). I didn’t waste any time buying more of this cream. I quickly bought 6 tubes, but I didn’t quite buy all of the scents. The scents I purchased this time were: (more) Grace Rose, Juicy Citron, & (more) Herb & Fruits Tea. I think I may have gone a little overboard with the hand creams, but since this cream is hard to get/find, I had to grab as much as I could to fill up my addiction to this cream! Buying these creams through Amazon Japan was a bit of a hassle, since there are, sadly, a lot of products that cannot be shipped to the United States through their website. However, I found a small loophole in which I used a forwarding service to be able to ship these to my American address. Unfortunately, you do need to pay a shipping & handling fee to the forwarding service, which can get expensive, but for small items such as these creams the small fee was well worth it…& these sweet babies arrived on my doorstep just in time! I am so happy I was able to find these creams again, & I can’t wait to use the other scents!! On a side note, here’s a little trick I learned from my mom on how to “squeeze” the most out of a tube of hand cream (or a tube of just about anything). Once I’ve squeezed a majority of the product through the cap of the tube, instead of squeezing the tube until it is flat, I will cut off approximately 1/4 to 1/3 of the end of the tube. Then, I can reach in & scrape off the remaining product from the walls of the tube. To cover the open end of the tube, I will use the cut-off end of the tube as a cap. Voila! It’s an easy way to get the most out of your tubed products.